The Beamer brothers are legends in their home state, and among slack key guitar aficionados worldwide. Their 1978 single “Honolulu City Lights” from the album of the same name was by far their biggest commercial success. It’s a nice song, to my ear inspired by Jimmy Webb but only songwriter and older brother Keola can vouch for that. The Carpenters covered “Honolulu City Lights,” too, if that does anything for you. The brothers stopped working together in the eighties, but both are still out there making music. They’re both exceptional guitarists — check them out. Now, about that album cover. I don’t know what Kapono is so pissed off about but he looks like he’s about to stab somebody. Maybe the dose of radiation that left him 1,500 feet tall left him cranky. Or maybe it was the biplanes flying around his head, I don’t know. 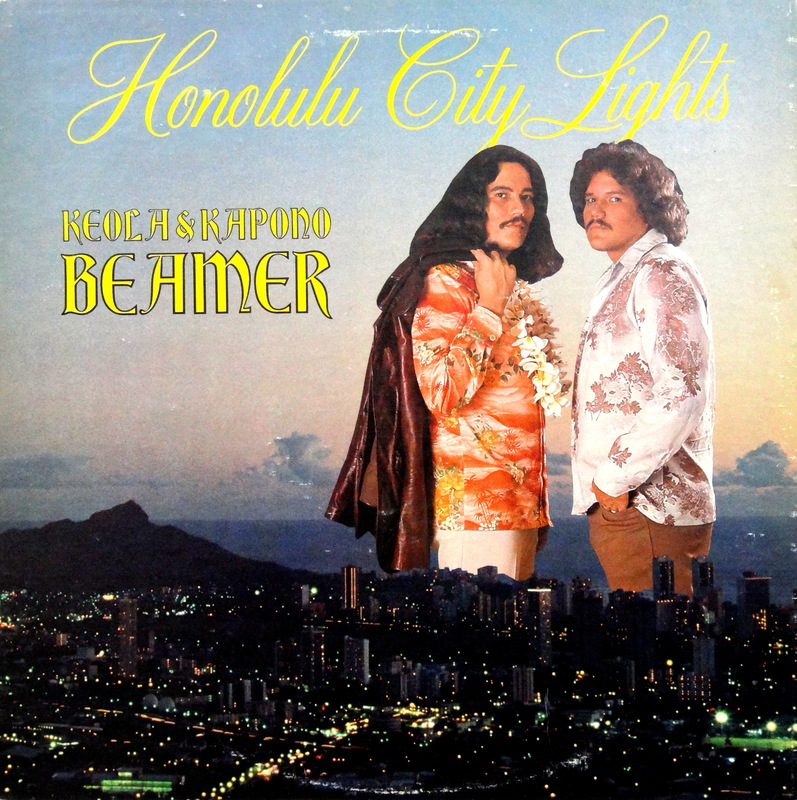 Regardless, let’s welcome Honolulu City Lights to the Bad Album Cover Hall Of Fame. I am pretty sure that is the “I canNOT tame the frizz no matter how much product I use” bad hair day scowl. In such a humid climate? That’s some bad frizz. They’re undoubtedly pissed off from having to always play tiny standard sized guitars. If I were a giant rock star, I know I’d be. Judging by how close they are standing, I am guessing we just interrupted a rather sensitive moment. Laura B., how you do talk (fans face).